Of all the industrial auxiliaries which the closing century has seen set up on the American continent the railroad just finished from Alaskan tide­water into the valley of the great Yukon is the boldest and most diffi­cult, and promises to be the most useful. A year ago the gold besprinkled Yukon water-shed was accessible only to the hardy mountaineer and at the cost of much money, immense labor and serious peril. Of all those who ven­tured up the Pacific through the Alexandria archipelago and Lynn Canal as far as Skaguay and Dyea at least a quarter turned back intimidated and dis­heartened, for in front of them loomed the precipitous coast range, with the terrible Dead Horse Trail, on the one hand, and on the other, only five miles north, the Chilkoot Trail from Dyea, even more terrible, with its dreaded avalanches and its cemeteries of numerous dead at Sheep Camp. To cross the divide was at the risk of limb and life, for it involved hitching along a narrow and insecure shelf through a dark defile over a turbulent river and climbing rocky walls that defied almost any creature not armed with claws. 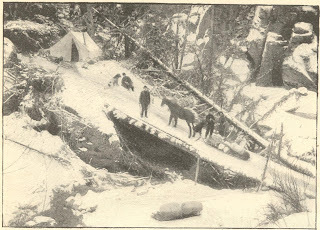 In Chilkoot Pass, back of Dyea, several scores of adventurous Argo­nauts had been buried beneath the tremendous slides of ice and rock from the summit, and the Indian trail from Skaguay over White Pass was popu­lous with buzzards feasting on the carcasses of a thousand horses which perished there in a single autumn. The narrow vale through which flows down to Lynn Canal the stream known as the Skaguay is one of the most humid portions of the earth's sur­face. It is carpeted with heavy moss, and the thick-set evergreens and tangle of dead trees are saturated with water and veiled with lichens of gigantic size and motley coloring, kept wet by tremendous storms of rain arid by an inces­sant down-flow of melted snow from the summits of mountains where winter makes its perpetual home. The climate of the sea coast and adjacent islands is equable and mild, the winters being scarcely as cold as those at Washing­ton, D. C. ; but the valley of the Yukon is cold and forbidding, constituting a strange contrast. To men impelled by gold hunger the coast range was only a temporary bugbear. American enterprise did not long remain idle in presence of this menacing obstruction. 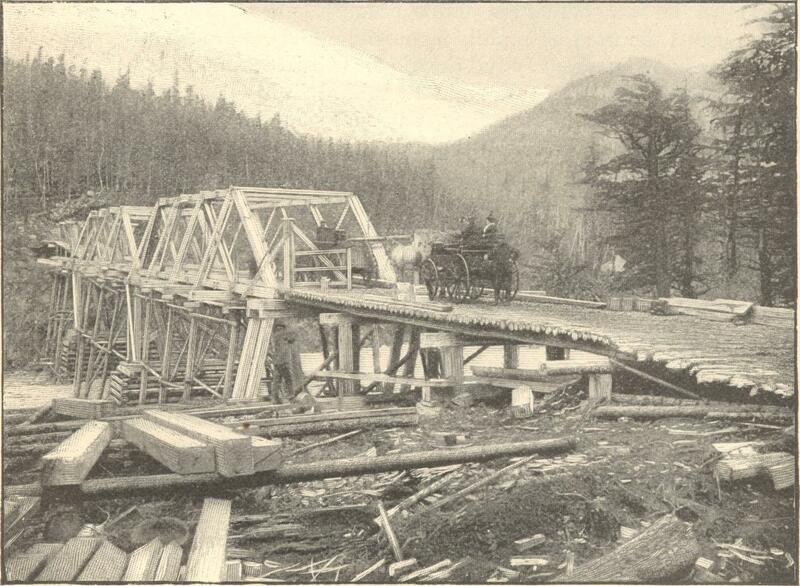 Chilkoot Pass is nearly a thousand feet higher than White Pass, on account of which important fact the great stream of eager transit turned in the spring of 1898 from the former into the latter. 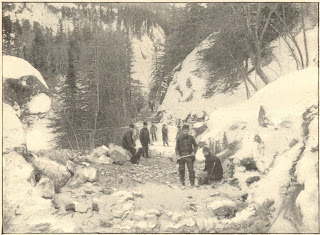 But even here the Thlinkit Trail was so terrible that, while thousands of the hardier succeeded in getting over and setting their frail boats afloat on the Upper Yukon at Lake Bennett, a hundred every week turned back, appalled and disheartened. One of the visitors to Skaguay in the fall of 1897 strolled up the Indian path which had even thus early accumulated so many of the carcasses of horses falling from the sloping rocks that it had borrowed from that circumstance the gruesome name of " Dead Horse Trail." 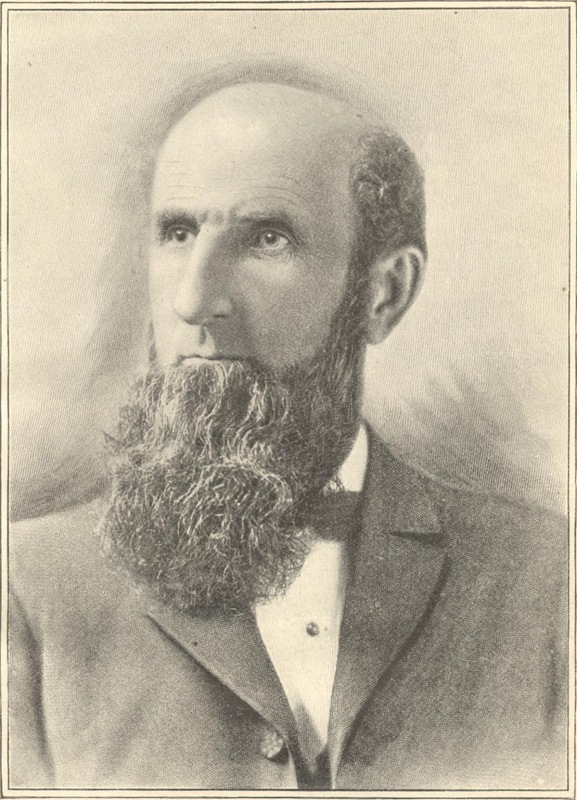 He was a man of mature years, shrewd, strong, alert, fearless, and not unacquainted with personal exposure in Indian wars and hazardous enterprises - Mr. George A. Brackett, one of the early pioneers of Minnesota. He climbed the trail to the summit of White Pass, and concluded that, though almost inaccessible to horses and dogs, it was practicable to build a wagon road through the dark defiles and up the frowning acclivities. From his tour of inspection he returned to Skaguay, where a company was formed for the purpose of building and cutting a road through the lowest pass of the coast range to Lake Bennett, the pro­jectors to reimburse themselves by charging a small toll to travelers. Mr. Brackett was made superintendent and general manager of the pro­ject. The members of the company agreed to put in $50 apiece, to begin the work immediately and to raise $125,000 more at once to continue and complete it. This large promise was doomed to scant fulfillment. Some $500 or $600 were raised, according to the terms of organization; but one member of the firm took $200 of it for drawing the papers, and another, equally thrifty, accepted $350 for alleged services as an engineer, while the treasurer decamped with the balance of the money, and his whereabouts has not yet been discovered by his associates. On November 8th, 1897, Mr. Brackett began work without a dollar of money excepting $3,500 of his own, which he had with him. He walked over the pass and back, found that no practical survey had been made, laid down approximately the lines of the proposed road, hired several hundred men and established camps between Skaguay and the summit. He every day expected to receive money from his theoretical partners in the enterprise. They had gone down to the States for the alleged purpose of obtaining it, and most of them never returned. By the 20th of December his money was gone, no more was in sight and the payment of his men for the week was overdue. Discovering that he had apparently been abandoned, he called a meeting of his workmen and took them wholly into his confidence. The next morning he started for Seattle, to raise funds in some way. He laid the project before the business men of that growing city, but failed to elicit from them any expression of interest or any money. He was very anxious and depressed over the situation, and prepared to start back to Skaguay. Friends warned him not to do so, as the men whom he owed on the trail would be sure to make his return dangerous. He re­plied that they had treated him squarely and frankly, and he should without hesitation go back and face them and tell them the exact situation. On that dark morning a friend whom he met oh the Pacific slope offered to mortgage his home and lend him $5,000 without security till he could go east and get some money. Mr. Brackett accepted the offer, took the money, sent it to-his agent at Skaguay and started east for more. Within a week he had borrowed $15,000 in Minneapolis and $10,000 in New York. He immediately returned to Skaguay and again pushed the work, hoping that the men associated with him would come to his relief. The hope was vain; they did not come. He had at that time 400 men in his employ along the trail; the unskilled laborers were receiving $2.50 a day; the experienced rock men, blasters, etc., $3, and the carpenters, $3.50. The enterprise proved far more expensive than was anticipated. 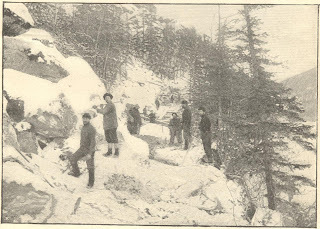 Work was going forward all along the line, with scores of men in every camp, and to get sup­plies to the remoter camps near the summit cost the promoter 20 cents a pound. Tents, tools and provisions were thus transported up the pathless rocks, for it had been deemed wise to begin the road at the summit and work back toward the sea, so that the most difficult section might be finished be­fore the total freeze-up of fall should intervene. Not less than 400 tons of dynamite were required to blast through the spurs of the mountain range, and some of it cost $600 a ton before it was unloaded from men's bucks at the point where it was to be used. Compelled to resort to such expensive methods, Mr. Brackett's money was spent again in a short time, and he started for the States for more, for wages were $10,000 behind and the workmen were anxious. He was fortunate in obtaining assistance. A friend in Canada forwarded him $7,500, and a man whom he met on the cars got interested in the project and lent him $8,500 more. Before spring came he had paid this out and was $30,000 behind with his men; but they were loyal to his interests, and he walked from camp to camp and assured them that he would get the money and stand by them to the last. He went to Seattle, and there by appointment met some gentlemen from Boston who had heard of the project, and, though they were perfect strangers to Mr. Brackett, not one of them having ever seen him before, they lent him $30,000 on the spot, taking his simple promise to pay. He returned to Ska­guay, pushed the work as rapidly as possible, hired more men, ran in debt to the merchants of Skaguay and Seattle for subsistence and equipment, and before summer time came was again far behind in his payments. Again he went to the States for more money, was successful in obtaining it, and be­lieved himself at last in sight of the end for which he had struggled. A large portion of the road was now finished and ready for business, espe­cially the worst part at the upper end, which had hitherto been almost passable by man. At the same time the charter which had been promised him at Washington was held up in the Senate, and the on-rushing crowd for the Yukon took violent possession of the road. On refusing to pay toll they were stopped by the men in charge, but they broke down the gates again and again and rushed forward over the summit. Colonel Anderson, commanding the United States troops at Skaguay, at last quelled the disorder and gave Mr. Brackett once more possession of his property. His troubles had now fairly begun. Some of the men who had nominally associated themselves with him in the first place; and agreed to raise the necessary funds, now made their reappearance at this juncture, and, seeing that the project was already a success, and that freight was being carried over the summit at greatly reduced cost, they straightway and boldly came to the front and demanded their share of the road! One of these, who had invested neither money nor labor, neither ingenuity nor counsel demanded stock in the road to the amount of $60,000! 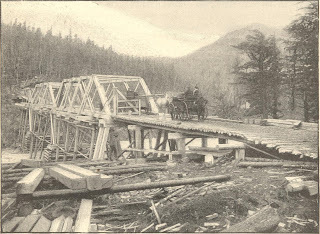 Before the road was finished Mr. Brackett had put into it not less than $185,000, and the men who had nothing in it but violated promises claimed to own it: Some of them bought up unpaid claims against Mr. Brackett to the amount of $3,000, and secured from the court at Sitka the appointment of a temporary receiver, and, subsequently, an order for his arrest for refusing to obey its mandate. Mr. Brackett had seven sons, active and intelligent men, averaging more than six feet tall, and he now sent for them to reinforce him in his singular battle with dishonesty and cupidity. Again and again parties desiring to harass him and defeat his project bought up the time-checks of his men and applied to have a receiver take his road; again and again he went to Sitka, redeemed the checks, and defeated the conspirators. 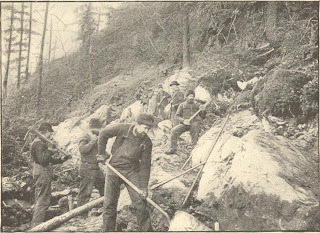 He was put in the hands of a receiver several times and was very much discouraged, when his workmen, whose pay was far behind, drew up and unanimously signed and carried a petition to the judge at Sitka not to permit him to be further perse­cuted, and declaring that they would sell no more time-checks to anybody. He was annoyed, however, by several other similar claimants, one of whom followed him to Seattle and brought suit for one-quarter of the entire stock of the road, desisting only after his case had been twice thrown out of court. The completed road was promptly opened for business, and proved to be as great a benefit as had been anticipated. The employees had all been paid off to the last dollar, and hundreds of them had joined the on-rushing thou­sands up the range and over the divide. The terrors of the trail had van­ished. White Pass was now easily surmounted by men and women, dog teams and wagons. The toll-taker was kept very busy, and tolls were paid with willingness. Packers who had the year before obtained 50 or 60 cents a pound, and sometimes even more, were now content with 10 or 12. The isolation of Alaska was at an end. 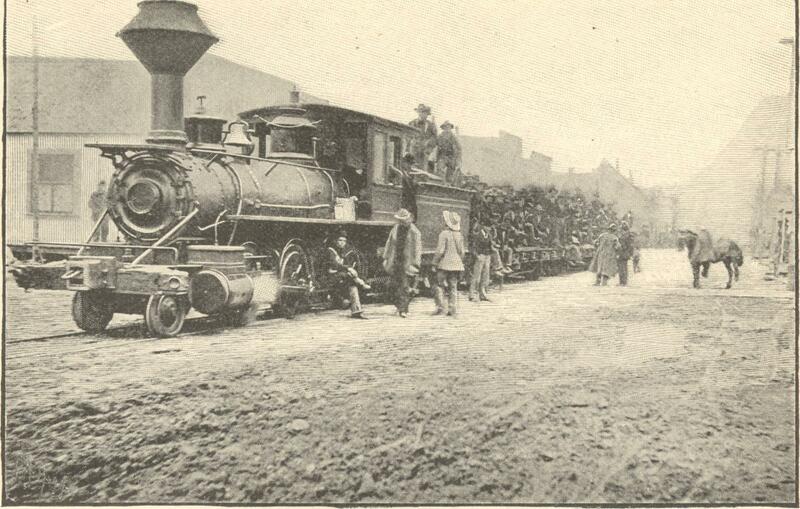 But another candidate had already appeared to contest with Brackett's wagon-road the commerce of White Pass. The "White Pass & Yukon Rail­road Company" had been organized. 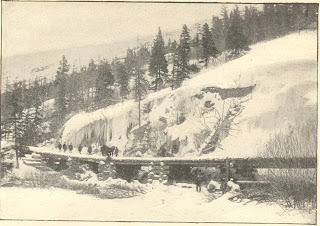 Some adventurous promoters from the east, visiting Skaguay, had walked over the wagon-road; paid their 25 cents toll to the summit and back, and concluded that a narrow-gauge steam rail­road was practicable. If it was practicable, of course it must be built. They raised the necessary funds and invited Mr. Brackett to a conference. They needed his right of way. He saw that his large investment would be greatly diminished in value by the realization of this new plan; but he also saw that it was feasible, and that it would be a great public benefit in making Alaska more accessible. He bowed to the inevitable, and made with the new-comers the best terms he could. Among the chief promoters of the new railroad who now appeared upon the ground were Mr. E. C. Hawkins, of Denver, and a well-known English engineer, Sir Thomas Tankford. 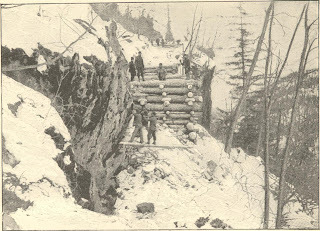 They obtained a charter from the British Yukon Company, and rapidly completed arrangements to build the line from Lake Bennett, on the Yukon, in British territory, over White Pass and down to Skaguay. The only eligible line was that already occupied by the wagon-road, and this fact compelled a compromise with Mr. Brackett. 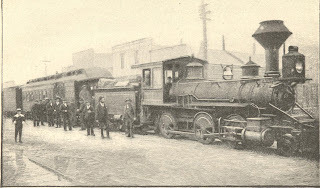 The conference thus resulted to the advantage of both parties, making the railroad feasible while saving the large amount that had already been invested in the wagon-road. Abundant funds for the railroad were forthcoming. The wagon-road was utilized for the transportation necessary. 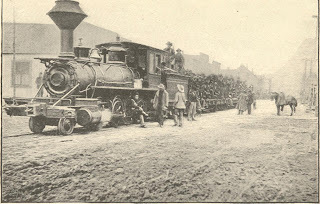 Before winter came again the railroad company had spent more than $2,000,000, and had completed 20 miles of substantial track, well ballasted, 3-foot gauge, 56-pound rail, and put on rolling stock before New Year's Day. 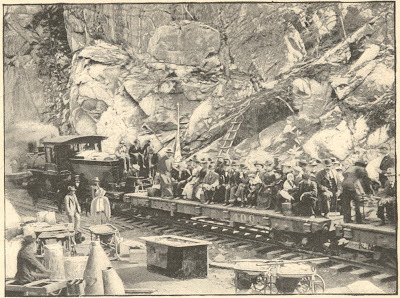 During the first month of 1899 a train of elegant cars was making regular trips from Skaguay to the summit of White Pass, and the company was pushing forward the road-bed down the eastern slope of the range into the valley of the Yukon. 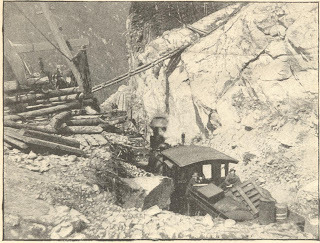 By the middle of the summer the road was completed to Lake Bennett, and it is being continued down the Yukon to Selkirk, 150 miles further north. The completed road rises 2,900 feet from Skaguay to the summit, and descends 450 feet in reaching Lake Bennett and the waters of the Upper Yukon. The visitor to Central Alaska no longer encounters any serious risk in mak­ing the trip. He can reach Lake Bennett next summer in a luxurious Pull­man coach, and in a few months more he may visit with similarly com­fortable environments Fort Selkirk, far toward the north, and the Atlin gold region, which has recently attained such celebrity, 100 miles eastward, over the Upper Yukon. When Brackett began his wagon-road the Indian packers charged 50 to 75 cents a pound for carrying goods from Skaguay over the summit. 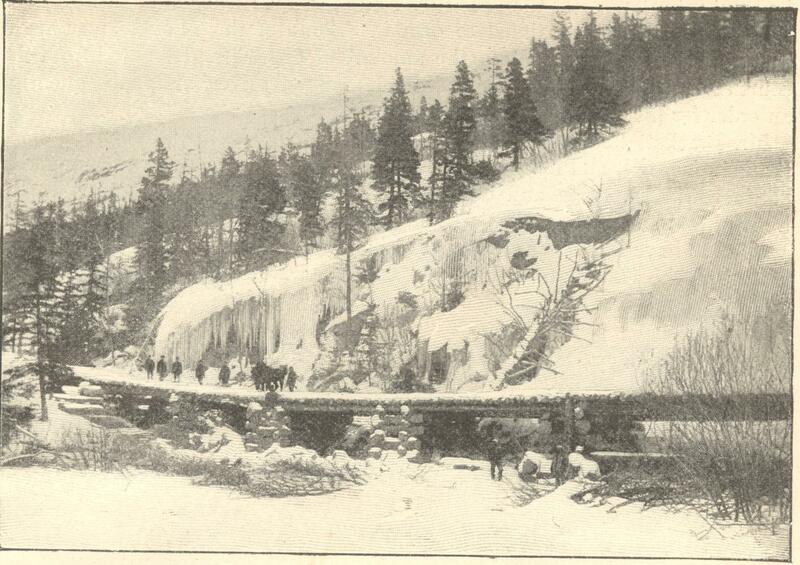 When the wagon-road was finished the rate, including toll, was 12 cents a pound. 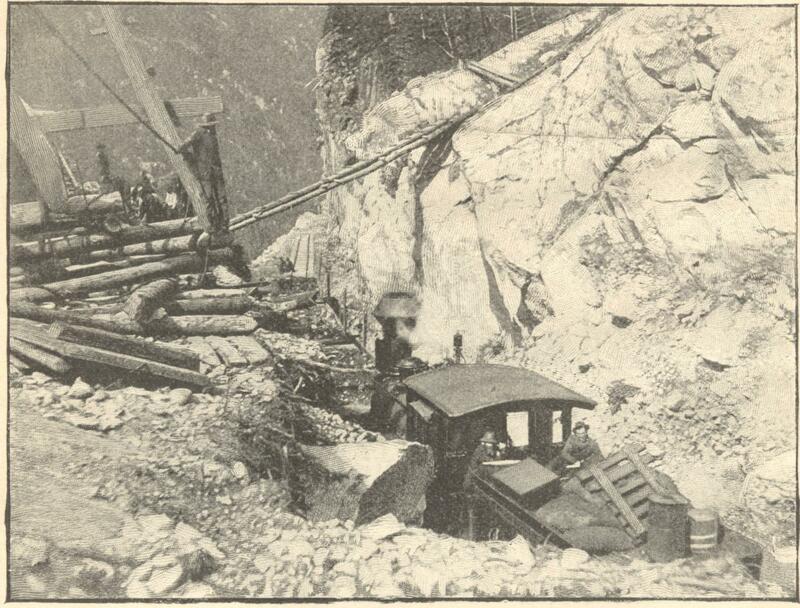 Now the railroad rate to the summit of White Pass for miners' supplies is 2 cents a pound and for other merchandise 2 cents a pound; and it is only 4 cents a pound to Lake Bennett since the road is completed to that point, and the same price to the mines of the Atlin district.